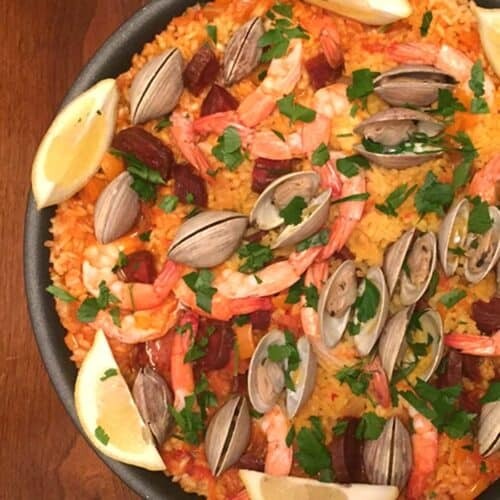 You'll never believe how easy it is to make Paella, all in about 30 minutes! A dinner filled with clams, shrimp & chorizo & served over saffron rice. Prior to starting dish, place clams in cool tap water and let sit for 20 minutes to 1 hour to purge sand. When ready to use, lift each one out individually and scrub outside. They are then ready to cook. Heat a large oven-proof skillet over medium-high heat. Add chorizo and cook for 4 minutes. Remove chorizo but keep rendered fat in pan. Add onion and red pepper and cook until soft & translucent. Add garlic, pimentón or paprika and saffron and cook about 30 seconds. Add chopped tomatoes and continue cooking for 3 minutes. Stir in rice. Add chicken stock, white wine, peas and chorizo, stirring together but leaving chorizo closer to top. Add bay leaves to top. DO NOT STIR. Bring to boiling, turn down, cover and simmer for 12 minutes. Add shrimp, tails up, and clams, hinge side down, then cover again and cook for another 5-10 minutes or until clams have opened. Remove from heat and let sit covered for another 5 minutes to allow rice to finish steaming. Sprinkle with parsley and serve with wedges of lemon.